Judy is a counsellor, trainer, and facilitator. Judy brings her warm spirit and wisdom to all of her training and counselling sessions. Judy believes that a counsellor and trainer must "walk with a person" as they move through their experiences in counselling and trainings. This helps people feel heard and understood. Judy feels our world would find more healing if more people experienced being listened to in a compassionate manner. Judy is there to offer support and encouragement to assist people in finding their own inner richness and personhood. Judy does not side-step difficult issues that people are not facing. Rather she confronts and challenges people in an honest and caring manner to face these issues and to move through them. Judy encourages people to face the difficult areas in their lives that they must face in order that they may find their own voice and place in the world. Judy is a Registered Psychologist (provisional) at the Masters level and holds a degree in Bachelor of Arts, High Honors in Psychology and a Masters in Educational Psychology. Judy is a certified trainer of Neuro-Linguistic Programming. She has been offering Neuro-Linguistic Programming Practitioner and Master Practitioner programs for 21 years. She is also a trained mediator with over 15 years of experience. Judy has training in Reality Therapy, Solution Focused Therapy, suicide intervention, Critical Incident Stress Debriefing, marriage counselling, Satir family drama, Eye Movement Integration Therapy, codependency, anger management, facilitation, and group counselling. Judy also has worked with Hawaiian Huna Shamans, Peruvian shamans, Navajo and Ojibwa elders. She also holds many other certifications and trainings in the healing arts and counselling. Judy Wright is a counsellor who has spent 26 years refining the tools and techniques that she utilizes within her practice and workshops to assist people in taking that next jump. Judy is known for her heart and ability to see clearly into the heart of people and help people develop more into who they truly are. David brings a warmth, gentleness, and genuineness to all his interactions with people. In the fall of 2014 David decided to step down as head of the guidance office in preparation for his retirement from teaching. David will continue to work in the guidance office through this year to help with succession planning. David plans to devote much of his retirement years to the Unbridled Development Group and its customers. David was a respected chemistry teacher for 20 years and for the past 15 years has been head of a high school guidance office. David holds a Bachelor of Education degree and Master of Arts in Educational Leadership and Counselling. David has training in Critical Incident Stress Debriefing, suicide intervention, risk assessment, Solution Focused Therapy, threat assessment, early crisis intervention, Neuro Linguistic Programming, Reality Therapy, Life Space Crisis Intervention, Circle of Courage training, and Eye Movement Integration Therapy. David Beriault has devoted his life to teaching and guiding young people to places of greater confidence and wholeness. David spends time at Gateways Counselling offering individual counselling sessions. He brings the knowledge he has gained in these many areas to Unbridled Development Corporation. David is known for his quiet calm and wise approach to life. Judy and David joined each other as life partners in 1998. They complement and support each other in their personal and professional journeys. 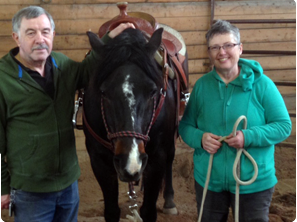 Together they were drawn to equine assisted learning and were fortunate enough to meet Cain and Roberta Quam. Judy and David have received special training from Cain Quam in the management and handling of horses. They own and board three horses at Cain Quam's and spend at least one afternoon a week keeping up with their horse management and riding skills.